Life has hit rock bottom for Andrea. After finding out she was a shapeshifter, the Order of Knights of Merciful Aid kicked her out with prejudice, leaving her without the stability of the only real family and loyalty she has ever known. Even worse is the fact that she lost the loyalty of her mate, Raphael when she chose the Order over his Pack. The only thing holding her together is her work with her best friend, Kate in their investigative firm. But when she's assigned to investigate a multiple homicide of shifters employed by Raphael, and forced to work with him, all the fine threads holding her old self together finally snap, leaving a very enraged and unpredictable bouda in their place. Andrea is such a damaged character, and in Gunmetal Magic we see her almost at her breaking point. Considering what she has endured, and how incredibly strong she is, it really shows just how hard things have become for her to come so close to breaking. To escape her past, she threw her entire loyalty into the Order, never once faltering even when it cost her the love of her life, Raphael. So, when they threw all of it back in her face and rejected her despite her many years of service, messed up can only begin to describe the state she was in. Yet, despite the horribleness of the situation, in all honestly I really think the Order dropping her was the best thing that ever happened to her. It forced her to finally face the other side of her nature. For years she has been living a half life as she suppressed her bouda side, but now that it has been exposed, she can't hide anymore. I only admired her even more as she started to pick up the broken pieces of her life to start the healing and made the hard decision of who she really wants to be. 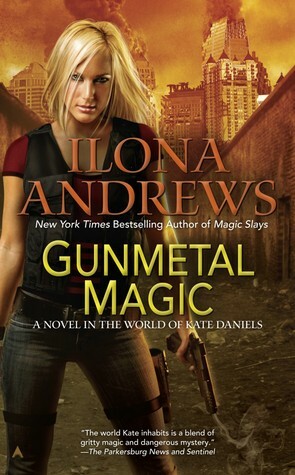 I have always loved Andrea's character in the Kate Daniels books, so I was really excited to find out she would be getting her own installment. She just had entirely too much going on for her personal messes to be justly resolved without completely overshadowing whatever crisis Kate was currently in. Even so, there still was a small worry that Andrea's installment wouldn't quite live up to the others. I shouldn't have worried as I absolutely loved it. 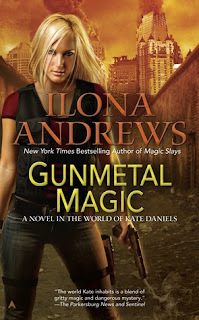 Every bit as good as its predecessors, Gunmetal Magic adds a new dimension to the already fantastic Kate Daniels world. Once again Ilona and Gordon proved just how fantastic they are as writers, seamlessly blending action, romance, and humor into a story that cannot be put down once it is started. Gunmetal Magic is not to be missed!